Why Tor Shuts Down its Anonymous Cloud Service? Why Tor Cloud Project Shuts Down? Yes, you heard that right. 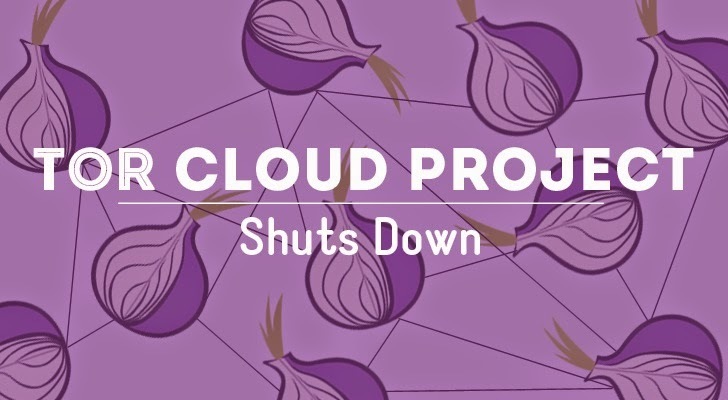 The Tor project has announced that it’s closing down its Tor Cloud service that allowed users to donate bandwidth for browsing the web anonymously. The Tor Project is a non-profit organization behind the Tor anonymizing network that allows any online user to browse the Internet without the fear of being tracked. And one of its lesser known projects was the Amazon-powered Tor Cloud service. Tor Cloud Project provided a user-friendly way for users to create a "bridge" node on Amazone’s Elastic Compute Cloud (EC2) for the Tor network, essentially donating bandwidth to the Tor network in order to help users access an uncensored Internet faster and securely. ...Why Tor is closing Tor Cloud Service? What could be the reason for the shutdown of Tor Cloud Project? Tor developers were unable to get enough help to maintain the software properly, and, as a result, a number of vulnerabilities in the system made parts of the Tor Cloud Service unusable to the users. "The main reason for discontinuing Tor Cloud is the fact that software requires maintenance, and Tor Cloud is no exception." "There is at least one major bug in the Tor Cloud image that makes it completely dysfunctional (meaning that users could not use this particular service to access the Internet), and there are over a dozen other bugs, at least one of them of highest priority." The vulnerability in packaging the Tor Cloud image forces users to include Tor or the obfsproxy traffic transformation software manually. The high-priority bug the Tor team referred to is the package key expired. As a result of these vulnerabilities, Tor said it has seen a continuous decline in the uptake of Tor Cloud bridges since early 2014. "We have tried to find a new maintainer for Tor Cloud for months, but without success," states the blog post. So, after failing to find anyone to manage the service, the decision was taken to shut down Tor Cloud Project. However, this does not mean Tor itself is dead; the shutdown has no effect on existing Tor Cloud instances. While Tor Cloud is no more, Tor developers are encouraging other developers to create their own forked versions of Tor Cloud. The manual bridge installs to Amazon EC2 platform will still work, and Tor Cloud bridges that are currently in service can still operate. "We encourage everyone who stepped up to start their own cloud bridges project under another name (Onion Cloud? ), possibly forking the existing Tor Cloud code that will remain available," the post said. "Tor Cloud is still a good idea, it just needs somebody to implement it." Tor is often used by political activists, journalist or those living under strict government regimes. However, media outlets and mainstream companies have also started to turn to the technology as well. Media organisations are using Tor to help protect the privacy of the whistleblowers. Moreover last year, Facebook revealed plans to switch on the anonymous access to the social network through Tor by launching a .onion address.